Winter is a Good Time to Bird? With winter upon us this is actually a good time to look for owls on your property. Most owls breed from January to March. You can either listen for calls in the evening, or use owl calls or recorded calls to get responses from owls in the area. We have three common species in Indiana and one rare species. All are non-migratory. However, each has different needs and habits. The following descriptions were written by Barny Dunning, professor of wildlife ecology at Purdue, and Jeff Riegel, field project supervisor at Purdue. These accounts were originally published in the Indiana Woodland Steward (www.inwoodlands.org). Owls are among the most intriguing animals native to Indiana. They have been celebrated in story from the myths of the early Greeks to the books of Harry Potter. Owls are common across much of the state, but are relatively unknown, probably because of the nocturnal habits of these birds. But since they are efficient predators of mice and rats, among other things, owls are very useful birds to have around. Three species of owls are common year-round residents in Hoosier forests. The largest of these is the great horned owl, one of the dominant predators of our forests. Most people are surprised to learn that the great horned owl is as common as the familiar redtailed hawk even though the owl is much less likely to be seen. Great horned owls hunt in open areas but nest in large trees, where they take over a nest abandoned by a hawk, crow or heron. They are common where both woods and fields mix. The owls start breeding in January and February, adding new sticks to an old nest and laying a clutch of three eggs. Most species of owls nest very early in the year so that there will be a lot of easily caught prey in the form of young mammals and birds when the owl chicks are learning to hunt on their own. Many nests of the great horned owl are in snags or trees with broken tops, therefore retaining some of these forest features will provide good nesting spots for this dominant bird. A second species of large owl is found in the larger woodlands of Indiana. The barred owl is most common in the interiors of forests and spends less time along the woodland edge. One major reason for this is the presence of the great horned owls, which will kill and eat a barred owl. Barred owls usually nest in the cavities of deciduous trees, laying their eggs in deep winter. Their dependence on tree cavities means that barred owls are likely to respond well to land management activities that retain large trees on a property and increase the number of snags with cavities. They also do well when there are forest patches of a variety of ages on a property, in addition to the older trees that provide nest sites. Eastern screech-owls are the smallest resident owl in the state. They nest in small tree cavities and readily make use of nest boxes made especially for them. More than the other two species, screech-owls are found in suburban backyards, urban parks and on college campuses – anywhere there is a variety of trees and shrubs. Screech-owls feed on small prey such as insects, songbirds and mice. They breed later than do the big owls, and have active nests in March and April. In addition to nest boxes, these owls willuse old cavities excavated by northern flickers, tree holes created by storm damage, and hollow trunksof snags. Their ready use of a wide variety of cavity types makes our screech-owls a prime beneficiaryof snag retention and other habitat improvement activities. Indiana’s smallest owl does not breed here, but its numbers during the fall migration can be in the thousands statewide. The northern saw-whet owlbreeds from the most northern states on into Canada and migrates from there when food becomes scarce. “Swets” are an irruptive species, meaning their populations rise and fall dramatically from one year to the next on a roughly four-year cycle. 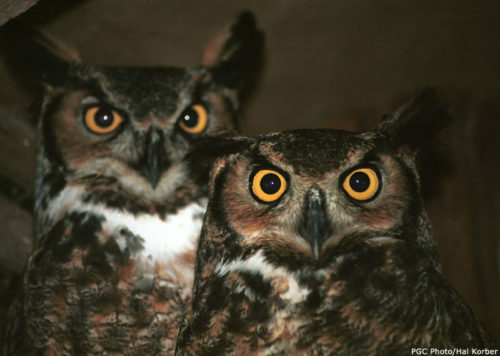 A group of volunteer researchers in Yellowwood State Forest began studying the movements of these owls in 2002 as part of the larger Project Owlnet (www.projectowlnet.org). Their first year produced 71 owls on just one ridge in Yellowwood. Since then, the annual numbers have averaged around 70, but nearly 200 owls were captured and banded on that same ridge in 2007. The low point in the cycle was in 2009 when only nine owls were captured. There are now eight such banding stations scattered around Indiana. Brookeville Reservoir had the largest number of captures in 2009 with 32; while an Indianapolis station tallied only six. Some northern saw-whet owls winter in Indiana where forests with an open understory provide good foraging opportunities throughout the winter months. The rarest owl in Indiana is, paradoxically, the species with the largest geographic range. Barn owls are found across the globe, but in the Midwestern United States their populations have declined dramatically. The species is considered endangered in Indiana. Barn owls originally nested in tree cavities, but when early settlers built barns and other farm buildings, the owls were quick to adapt. They are not limited to barns however, as recent Hoosier nests have been found in old churches, silos, and within the walls of abandoned buildings. To be suitable, human structures must have openings that allow the owls to fly in and out and an interior area that is undisturbed and big enough for the nest. The biggest factor in their decline has been changing agricultural practices. Barn owls hunt in open areas such as pastures, but do not use rowcrop fields. As Hoosier farmers converted pastures to corn and soybean, the barn owl lost its hunting grounds. Farmers in the southern part of the state that still retain some open grassy fields on their land can contact the state Department of Natural Resources to have a barn owl nest box added to their outbuildings if they don’t have appropriate nest sites.